Weekly Review No.9: Come on Tim! This week, foxes are granted a reprieve, Corbyn takes the lead and the Liberal Democrats have a new leader. However, this vote wasn't really about fox hunting, instead it was a trap for the Scottish Nationalists. After the failure of EVEL, the Conservatives needed to justify its need to its own backbenchers and the wider British public – and the SNP fell right into it. A long night of soul searching from Angus Robertson's MPs led to them dropping their long-standing policy of abstaining from any votes that don't affect Scotland. They argued that changing the law in England & Wales would remove any reason for the law to be changed in Scotland. This promise meant that the government's chance of getting the law passed evaporate – as rebels within their own party would lead to defeat. However, they did ensure the debate on EVEL was re-energised, especially amongst the sceptics in the Tory party. Another week goes on and the Labour party is still leaderless, but some members worst fears came true this week. The hard-left socialist Jeremy Corbyn's campaign is going from strength to strength, which says something about the other candidates! Private polling this week has revealed that he may even be leading – although we all know not to trust polls! This news is bad news for Labour, the presence of Corbyn in the campaign was initially supposed to be tokenism, but it now seems he has a shot – especially with the backing of the Unite union. If Corbyn wins Labour will be banished from mainstream politics and more support will evaporate – it'll be a repeat of the 1980s when Michael Foot was the leader. Corbyn winning would benefit one party though...the Liberal Democrats. On Thursday, the Liberal Democrats announced their new leader – Tim Farron, MP for Westmorland and Lonsdale. This blogger attended the leader's rally in Islington on Thursday night (and nearly fainted from excitement...or maybe it was the heat). Farron gave a fantastic speech, he highlighted the need for a Liberal party in the face of the Tories and the SNP and promised to fight hard to rebuild the party. The fightback has already started, with the party gaining two council seats in by-elections while successfully defending a third that very evening. However, much of the press coverage has focused on Tim Farron's religious beliefs, something that really shouldn't matter in this day and age – although it may have more to do with his previous voting record. Let's hope the press move on from this obsession over his religious beliefs and focuses on the good the Lib Dems will be doing in opposition. When Michael Gove was appointed Justice Secretary many were worried, the former Education Secretary had a reputation for stirring things up. However, this week he's done some very sensible things – he's lifted to ridiculous limit on the number of books prisoners were allowed to have, he's indicated that he'll be reducing the number of sent to prison and he'll be granting early release to prisoners who improve their education. In this blogger's opinion, this is a move in the right direction – many prisoners lack basic qualifications and this will go way some way to improving their prospects after release. As well as that, far too many people are sent to prison in the first place – prison should be primarily for people who are a danger society and increasing the number of community sentences would reduce the burden on the taxpayer. 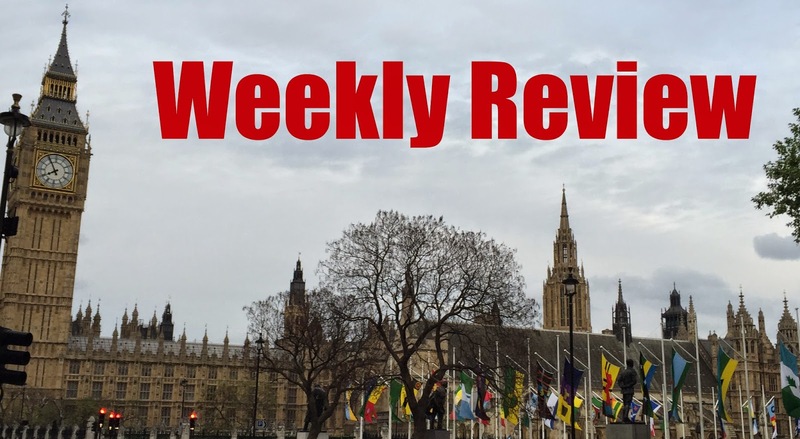 That's it for another a week in politics, as always, let me know your opinions by commenting below or tweet me.